This tutorial is based on an old version of DF, and needs to be updated. In this tutorial we’ll look at managing our dwarfs, a topic we have ignored until now. 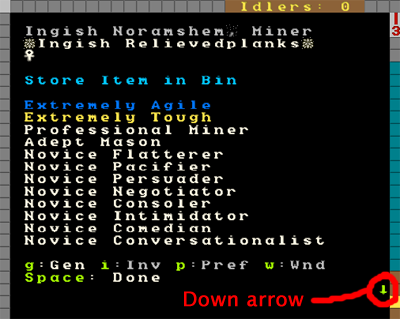 Dwarf management isn’t that hard, but there’s lots of subtlety to it, as I’m sure you can imagine. You also have to learn to navigate the interface, which is its own special challenge! 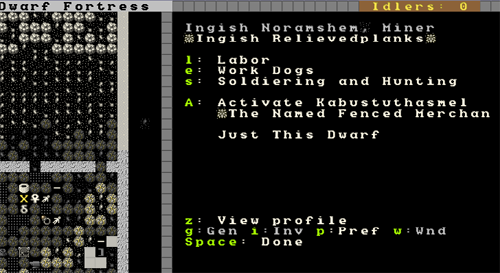 On the left, a list of dwarfs with their name and current profession (the game works out the dwarf’s profession based on their best skill, unless you assign them a custom profession name, more on that later). On the right, we have the current job the listed dwarf is doing. You will note that the list includes more then just dwarfs. You can scroll up and down using PageUp and PageDown as well as the arrow keys so have a look around. This is the full list of all living creatures in the current area (excluding vermin), so it’s a good way to see how many goblins you’re facing when the inevitable siege occurs! Had a good look? Great! Now lets get on with working with our dwarfs. 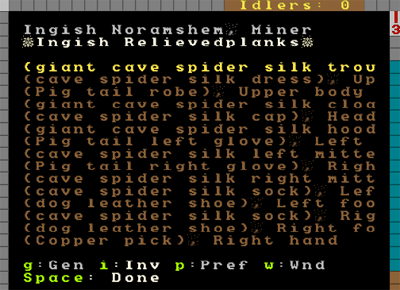 With the first dwarf selected, hit c for Zoom-Cre. Using this shortcut will become extremely familiar to you as you jump to this list, select a dwarf, and whack c to see what on earth they are up to now! Lets examine what we can see here. On the left we have a yellow X over the dwarf we selected. If we were to move the X around using the arrow keys we’d see the info on the right change as the closest dwarf to the X changes. By the way, you can pull up the X directly without going through u just by hitting v from the main map. This is really handy for when you’re trying to work out which dwarf is skulking around the dining room not doing any work! So, lets focus back on Ingish Noramshem, Miner. You can see some info about this stunty. First up, you can go to the l for “Labour” menu, the e for “Work Dogs”, s for “Soldiering and Hunting” or you can A “activate” the dwarf. Don’t worry about any of those just yet! Instead, look at the bottom menu list. We’ve got z, “View profile” and a list of other shortcuts. Not much to see. 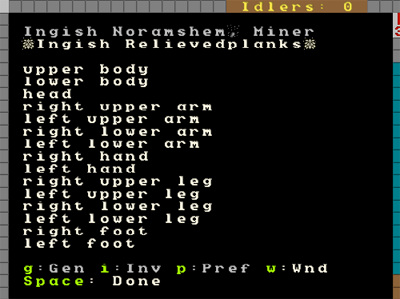 We can see that this dwarf owns 14 things (snore), has a modest quarters. The text is in blue, which I’m guessing is a good thing which means that it is over and above the quality demanded by that noble (thank Ookpik). 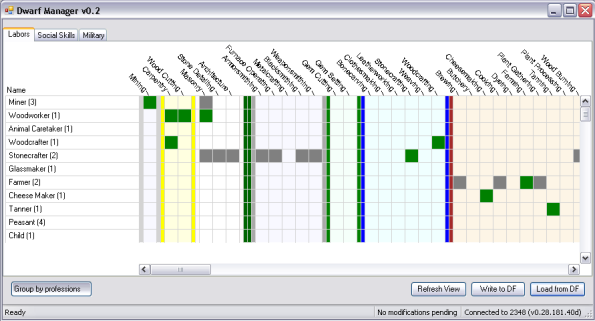 Below, we can see we have three options, we can hit enter, view relationships with “r” or customize with “y”. Lets go ahead and hit “enter”. Oof! Wall of text! With this examining done, space back a menu and hit r.
To be honest, I seldom view this screen and I’m not sure if we really need to. I just noticed that with the selection over the deity you can hit v and get information on the god worshipped, cool! This dwarf worships Agesh, who “often takes the form of a female dwarf and is associated with fame, rumors, agriculture, the rain and rainbows”, sounds delightful! Anyway, back out of that menu and hit y for “Customize”. You get an option now, customize nickname and customise profession. Some people use these to tag their dwarfs for more easy viewing, or to name them after friends and family for general hilarity, I leave this option alone because I have plans for them using the Dwarf Manager utility, but more on that later. If you want to make this list easier to read, hit Tab a few times until the menu takes up half the screen. Then you can see all the item names in full (this tip is especially helpful with some workshop menus where item names are long). You can use this list of inventory items to check closely what your dwarf is carrying. Scroll through each item using the alt-scroll method, and hit Enter and v if you want to learn more. The inventory screen is one you’ll use often when dealing with the military side of Dwarf Fortress. Don’t worry too much about it for now. This section uses the precursor to current tools. Look up Dwarf Therapist instead, and admire the fantastic user manual it comes with. You have now created a custom profession. 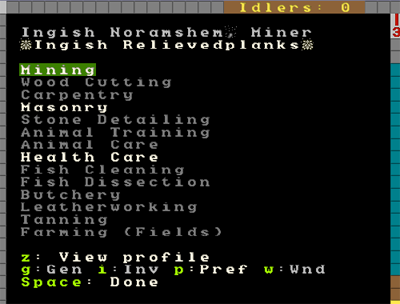 Now right-click on the next dwarf, chose custom profession, click on “Digger”, like the picture.